Our old flatbed scanner for the computer recently died and we replaced it with a new multi-function printer. Of course, I saved the old scanner in the basement for some reason. Well, my wife recently asked me to build her a small light table for her to use to copy the paper patterns that she uses for quilting. 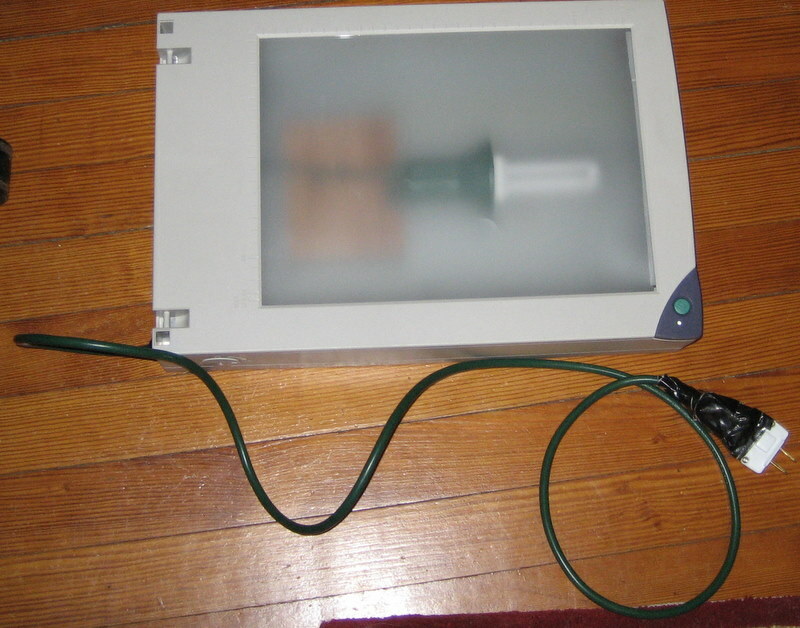 I started to design one in my head, and then decided that if I just pull all of the guts out of the old scanner and replace them with a fluorescent light bulb (so as to not generate too much heat), I’d have light table. I also put a translucent piece of plastic under the glass top of the scanner bed to diffuse the light from the light bulb a bit. It works. Half an hour and some spare parts from the shop and we have a portable light table. Good use for an old scanner if you have one. Matt Sanfilippo is the Chief Partnership Officer (CPO) for the College of Engineering at Carnegie Mellon University (CMU) and Co-Director of its Engineering Research Accelerator. In this role, Matt coordinates and enables strategic and sponsored research opportunities across the college, and stewards the development of proposals for major research opportunities along strategic themes. Additionally, he enables collaboration among the college's research institute/center executive directors, and industrial and government relations personnel in the pursuit of opportunities with industry, federal and state governments. Before becoming CPO for the College, Matt was the Senior Executive Director for Research Initiatives, the Executive Director of CMU's SII (Smart Infrastructure Institute) and ICES (Institute for Complex Engineered Systems), and Associate Director of PITA (Pennsylvania Infrastructure Technology Alliance) and RAMP (Research for Advanced Manufacturing in Pennsylvania). Before CMU, Matt was Managing Director of Applied Technology for Michael Baker Corporation, an engineering and energy services firm. Matt managed Baker's technology division including Geographic Information System (GIS), software and web development, multimedia, virtual reality, visualization, Global Positioning System (GPS), mapping and surveying services. Before joining Baker, Matt was an Innovation Director for Redleaf Group, a Venture Capital/Operating Company focused on information security, supply chain and mobility solutions. While at Redleaf, Matt managed technical due diligence for seed-stage investments and coordinated relationships between Redleaf and their partner companies. Prior to Redleaf, Matt was CIO of GZA GeoEnvironmental Technologies, an infrastructure engineering firm, and operations manager for their Internet start-up that focused on web-technologies for health and safety and manufacturing metrics. Matt is on the board of Larson Design Group (LDG), past Chairman of the Board for the Pittsburgh Botanic Garden, current board member of the Pittsburgh History and Landmarks Foundation (PHLF), current Vice President of the Sewickley Heights Gun Club (SHGC) and former member of the Information Sciences and Technology Advisory Board for the Pennsylvania State University Beaver. Matt is also former Vice President of the Pittsburgh Chapter of the Association of Internet Professionals and former Vice President of the Board of Trustees for Baker Combined Charity of Pennsylvania. Posted on July 23, 2006, in Gadgets and Gizmos. Bookmark the permalink. 6 Comments. It could be used like a negatoscope, wich is where doctors often read radiographs! Cool! I love the idea that the thing that I made to help my wife quilt can be used for medical purposes! I wonder if a white background and tucking the light under the left side would make for more even lighting. Very nice. i’ve been wanting to make something like this for a while. i was wondering where you found the translucent plastic, ’cause it’s been nearly impossible for me to find so far. Just a thought: I bought some self adhesive plastic film for my glass paned pocket doors. It is “frosted” and translucent. I bought a pretty big roll, I think it was about 48 x 96 inches for $20 at the hardware store. This would work great on either side of the glass. The non-sticky side feels about like a sheet of paper. It diffuses the light perfectly. Sanding the glass sounds like a good idea. I tried to tuck the light source under the side as you mention, but it was not bright enough then. Maybe with a brighter bulb, but I was going with what I had on hand. The white paint would probably help too. I got the translucent plastic at a Michael’s craft store and just attached it to the underside of the glass with small bits of duct tape. The plastic is very thin and was sold as a tracing material.